While oil and gas remain his passion, right now Petersen is content to focus on ensuring a good, diversified legal practice, ‘one that works in resources’ and has a reputation for advancing the views of his clients within the parameters of regulation. If this means he needs to pick up his sword and challenge the country’s energy policies as he does with oil and gas, he will do so, ‘as often as it takes to ensure we have legal frameworks that our investors and clients – both local and international, can work within’, he says. Petersen adds that there is lots to be excited about in terms of how power could be generated in South Africa in the future, even currently. 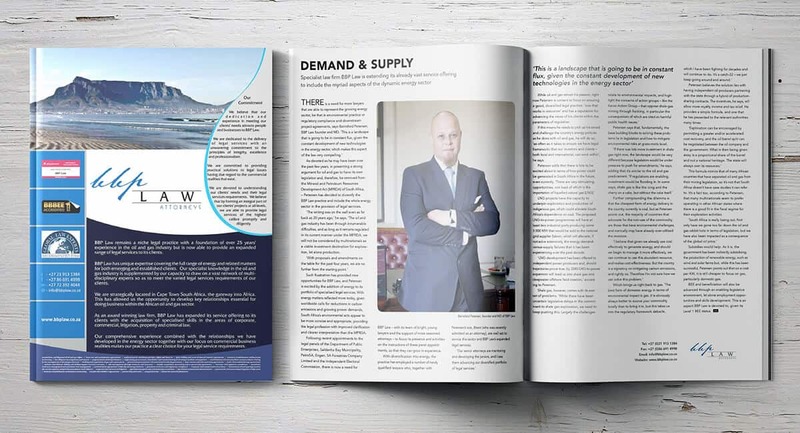 ‘There are very stimulating opportunities, not least of which is the importation of liquefied natural gas [LNG].’ LNG projects have the capacity to underpin exploration and production of indigenous gas, which could alleviate South Africa’s dependence on coal. The proposed LNG-to-power programmes will have at least two industrial ports producing some 3 000 MW that would be sold to the national grid supplier Eskom, which will alleviate, if not solve extensively, the energy demandversus-supply failures that it has been experiencing over the past decade. ‘LNG development has been offered to independent power producers and, should trajectories prove true, by 2040 LNG-to-power expansion will lead us into shale gas and deepwater offshore field creation,’ according to Petersen. Shale gas, however, comes with its own set of problems. ‘While there have been uncertain legislative delays in the commitment to shale gas exploration, we need to keep pushing this. Largely the challenges relate to environmental impacts, and highlight the concerns of action groups – like the Karoo Action Group – that oppose shale-gas mining through fracking, in particular the consequences of which are cited as harmful public health issues.’ Petersen says that, fundamentally, the base building blocks to solving these problems lie in legislation and how to mitigate environmental risks at grass-roots level. ‘If there was lots more investment in shale gas right now, the landscape would be very different because legislators would be under pressure to push for amendments,’ he says, adding that it’s similar to the oil and gas predicament. ‘If regulations are enabling, investment would be flooding in. In some ways, shale gas is like the icing and the cherry on a cake, but without the cake itself.’ Further compounding the dilemma is that the cheapest form of energy delivery in the country currently is coal, but as Petersen points out, the majority of countries that advocate for the non-use of the commodity are those that have environmental challenges, and ironically may have already over-utilised the resource. ‘I believe that given we already use coal effectively to generate energy, and should we begin to manage it more effectively, we can continue to use this abundant resource, and realise cost-effectiveness. But the country is a signatory on mitigating carbon emissions, and rightly so. Therefore I’m not sure how we can solve this problem.’ Which brings us right back to gas. ‘The best form of domestic energy in terms of environmental impact is gas. It is obviously always better to source your commodity locally than to bring it in, but this takes us into the regulatory framework debacle, which I have been fighting for decades and will continue to do. It’s a catch-22 – we just keep going around and around.’ Petersen believes the solution lies with having independent oil producers partnering with the state through a hybrid of productionsharing contracts. The incentives, he says, will allow more royalty income and tax relief. He provides a simple formula, and one that he has presented to the relevant authorities many times. ‘Exploration can be encouraged by permitting a greater and/or accelerated cost recovery, and the oil barrel split can be negotiated between the oil company and the government. What is then being given away is a proportional share of the barrel and not a national heritage. The state will always own its resources.’ This formula mimics that of many African countries that have separated oil and gas from their mining legislation, so it’s not that South Africa doesn’t have case studies it can refer to. It’s a fact too, according to Petersen, that many multinationals seem to prefer operating in other African states where there is a good fit in the fiscal regime for their exploration activities. ‘South Africa is really losing out. Not only have we gone too far down the oil and gas rabbit hole in terms of legislation, but we have also been impacted as a consequence of the global oil price.’ Subsidies would help. As it is, the government has been indirectly subsidising the production of renewable energy, such as wind and solar farms but, while this has been successful, Petersen points out that on a cost per KW, it is still cheaper to focus on gas, particularly domestic gas. BEE and beneficiation will also be advanced through an enabling legislative environment, let alone employment opportunities and skills development. This is an aspect BBP Law is devoted to, given its Level 1 BEE status.